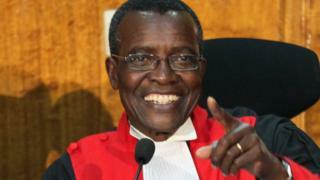 Kenya's Chief Justice David Maraga, and three of his colleagues, have created history by annulling the August presidential election. It is unprecedented in Africa for an opposition court challenge against a presidential election to succeed. Kenyans have praised Justice Maraga for having the courage to rule against the man who appointed him, President Uhuru Kenyatta, and for restoring their faith in the independence of the judiciary. Several Kenyan papers have referred to Justice Maraga as a person of integrity, which they attribute to his being a devout Seventh-day Adventist. He reportedly told an interview panel that if appointed Chief Justice, he would never preside over a case on a Saturday, a day of rest and worship for members of the Adventist faith. Some have speculated that this may have been the reason the first sitting of the presidential election petition was held on a Saturday night, after the Sabbath had ended. It is reported that while being vetted for his job, he was confronted with allegations that he had taken bribes. He surprised the public by standing before TV cameras and swearing on a Bible that he had never taken a bribe in his life. Justice Maraga, 66, graduated as a lawyer 40 years ago from the University of Nairobi, before going into private practice. He was appointed a judge in 2003 and rose to join the Court of Appeal in 2012. Last year, following the early retirement of former Chief Justice Willy Mutunga, he beat off stiff competition from 10 other prominent judges, legal practitioners and academics to be nominated by the Judicial Services Commission (JSC) to become chief justice. However, earlier this year he is reported to have rebuked the man who appointed him - President Kenyatta. Mr Kenyatta, while campaigning for re-election in Justice Maraga's home area, had told people that they should vote for him because his government had given "their son" a job. The chief justice, through the JSC, stated that he was not a government project. The president initially said he would accept the Supreme Court's ruling, although he did question why "six people [the judges] have decided that they will go against the will of the people". However, he later said that the judges had been "paid by foreigners and other fools". "[Chief Justice] Maraga and his thugs have decided to cancel the election. Now I am no longer the president-elect. I am the serving president... Maraga should know that he is now dealing with the serving president." Despite the implied threat, the president does not have the power to sack the chief justice, whose single term expires when he turns 70.